It's because I think too much: Dead iPod? 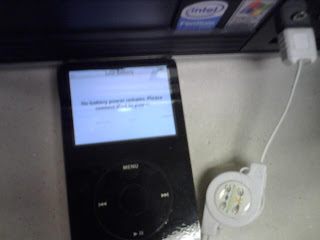 I think my iPod is dying. When this happens, it disconnects itself from my computer thus my music ceases to play. After several minutes, it reconnects itself. I start to play my music. After a few minutes the cycle starts over with the beeping. Mike recommended resetting it so I tried that, but it hasn't helped. If it's dead, I'll be ever so sad! Has anything like this ever happened to you? Any suggestions on what may be wrong? I HAVE to have music at work though, so I decided to go ahead and pay for a month's subscription to Last.fm. thank you so much for the kind comment. very very kind. as for your ipod I can't really help because i don't have one. But if you have a computer at work try www.pandora.com it's free. very worth trying. i use it everyday. Yeah, I've used Pandora... I liked it fine, but I like being able to listen to the songs that I want to listen to rather than something that is similar to what I want to listen to.